Kokopelli – the ancient creative spirit of Native America and Mesoamerica. Some say he originated in Olmec society, the first people to discover the revered cocoa bean and produce chocolate. 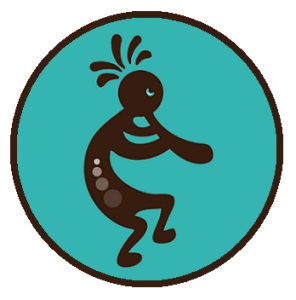 Kokopelli is a wandering trader, announcing his arrival in a new village with a merry tune on his flute. There are many legends about what he carries in the hump on his back – it may even be cocoa beans! He spreads joy and magic wherever he travels. The scientific name for the cacao tree is Theobroma cacao, meaning ‘food of the gods’. Kokopelli is known as a trickster deity and a Casanova, using chocolate, the food of the gods, to seduce unsuspecting maidens. The connection between chocolate and love is one that goes back thousands of years! This ancient figure of wonder inspires awe and curiosity wherever he travels, even to this day. At Kokopelli’s Chocolate, we hope to embody the creative, playful spirit of Kokopelli in everything we do, and to spread love the best way we know how – with magical, seductive chocolate.